Last week I reviewed Kingston’s microDuo which is a great solution if your smartphone or tablet supports OTG. Unfortunately, many devices don’t and if yours falls into this category, Kingston can still help you with both the MobileLite Wireless and the Wi-Drive. In this review, I’ll be checking out the MobileLite Wireless and will follow up with the Wi-Drive later in the week. 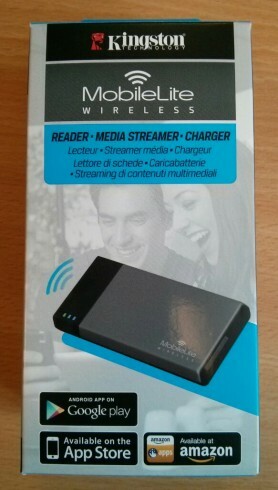 The Kingston MobileLite Wireless is described as “Reader – Media Streamer – Charger” and combines a USB reader, SD card reader, media streamer and USB charger all in one. Sounds impressive, so let’s take a look. 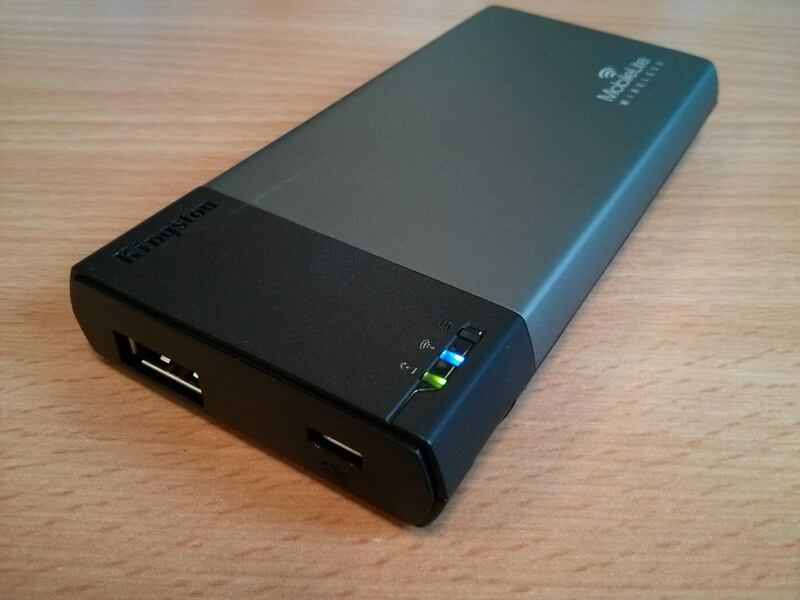 As you’ll see from the picture, the MobileLite is a small rectangular unit, around 12.5 x 6 x 1.6 cm. It weighs 98g and it feels a little lighter than it should. On one end is the SD card slot and on the other two USB sockets; one USB2 and the other microUSB. There’s a power button on the side and couple of indicator LEDs on the top. As well as the instructions, a USB-to-microUSB cable and a microSD-to-SD card adaptor is included in the box. Taking each of the MobileLite Wireless features in turn and starting with “Reader”, the MobileLite can act as an SD card and USB reader. Simply connect the supplied cable from your PC’s USB port to the microUSB port on the device and two new drive letters or storage locations will appear on the desktop. Drag’n’drop, view photos, play movies, all the usual activities, no problem. Obviously it’s only USB2 but right now, that’s no big deal. Moving to the “Charger” feature, swap over the cable so that the USB connector is plugged into the MobileLite Wireless and the other end into your smartphone or other power-sapping device. The battery is only 1800 mAh, so there’s really only one full charge of a smartphone in there. Finally, it’s time for the “Media Streamer” feature, which lets up to three devices stream movies and other content from the MobileLite Wireless over WiFi. Which it does. 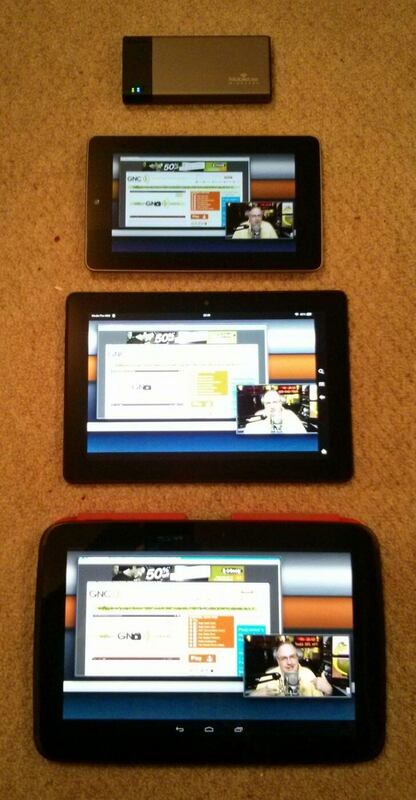 Here’s Todd and the GNC show on three devices, all streaming from the one MobileLite Wireless. The tablets and smartphones have to load a Kingston app to access the media, but the app is available from Apple’s App Store, Google Play and Amazon’s Appstore. The inclusion of Amazon is great as it means I can use the MobileLite Wireless with the Kindle Fire HDX – it’s the middle tablet in the shot above. However, the app is fairly basic and largely limited to navigating the folder hierarchy, selecting different content types, viewing and playing content plus operations such as email, copy and delete. It’s designed for smartphones rather than tablets so doesn’t take advantage of the larger screen real estate. Definitely room for improvement here. The app does have a couple of introductory pages to operative the MobileLite Wireless which have a cool hand-drawn feel to them. The MobileLite Wireless also presents a web interface which can be used by PCs and Chromebooks to access the same files, though I didn’t seem to be able to upload content. The web interface has additional tools to adjust the wireless settings for greater security. 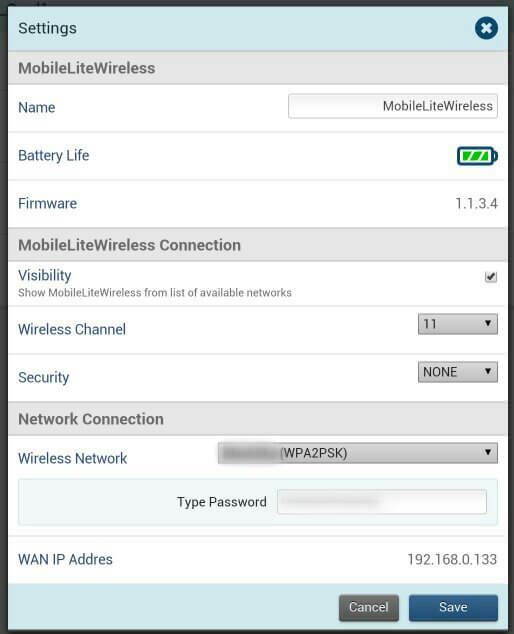 One cool feature is that you can add the MobileLite Wireless to your main WiFi network and once connected up will pass on any requests onto the Internet, so you can browse the internet at the same time as listening to music coming from the MobileLite Wireless. Battery life is “up to 5 hours of continuous use” and I managed a little under four hours playing a film continuously. Your mileage may vary but it’s enough to watch a couple of films. In summing up, the MobileLite Wireless is a handy little device that I feel will appeal to those who frequently use SD cards and other removable storage. Obviously it would be great for photographers who want to review material on a larger screen but it’s also handy if you need to transfer material to a smartphone or tablet from a USB memory stick as outside of the Windows ecosystem, few tablets have full size USB ports. It certainly works well for streaming video and music too, but Kingston’s Wi-Drive might be a better solution for those who simply don’t have much space on their smartphone or tablet. The negatives are that the app could do with a refresh and a bigger battery would make the charger more effective, but other than that, there’s little to complain about. 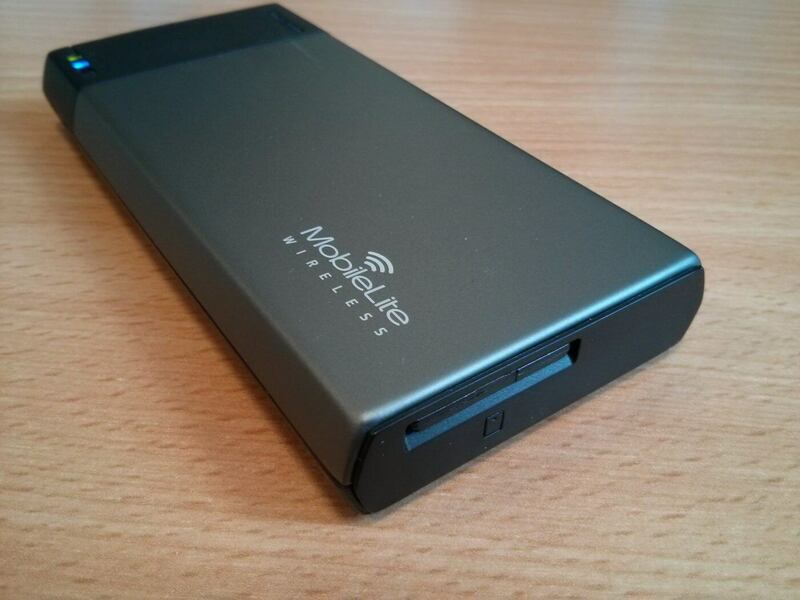 The MobileLite Wireless is available on-line for around £35. Thanks to Kingston for the review unit.